It has been a while since my last post, I have certainly been a very busy Mermaid! But I just couldn't wait to tell you about the Merfolk Uk Convention 2018 that I attended last weekend! Be prepared... This is a long one! The event was organised at the end of last year, and I bought my tickets way back in October- Eek! I had heard so much about it from fellow UK Mermaids and I had researched it myself, and everything I had heard about it was amazing, let me tell you, I was not disappointed! The event took place on Saturday the 7th of April 2018 down in London, so myself and some of my mersisters had arranged to spend the whole weekend in London to catch up and have fun! Seeing as we are based all over the country and it had been so long since we saw each other, we thought it would be lovely for us to spend some quality time together! Myself and two of my mersisters travelled down to London (singing Disney songs the whole journey) where we met the adorable Mermaid Athira who is none other than the representative for Miss Mermaid Sweden! We hit it off immediately and we are now really good friends, I count her as one of my adoptive mersisters! It was a wonderful Friday night, we were all so excited for the next day! We went out for dinner and met up with some other mers, including Lily Rose, the English Mermaid! What a beauty she is! A sassy and cool mer, she always had it together! We could all hardly sleep from all the excitement and anticipation for the day ahead! We were woken by a knock on the door, our beautiful Becca Blue, Miss Mermaid Scotland had arrived to join us! After donning our makeup and Mermaid Crowns, we headed to the event! When we reached the venue, we were reunited with my darling mersisters, Jessiella, Liana, Merstacia, Hannah, Sam and Mermomma Grace! All spectacular, they each offered something unique and special! Not to mention we were reunited with our Mertographer from Merpod1, Mr Paul Dale and our darling Freedive Instructor Steve Millard! A quick tour of the stalls was followed by the announcement that the pool was now open! And of course, us water babies flocked to the pool like a magnet pulls metal! 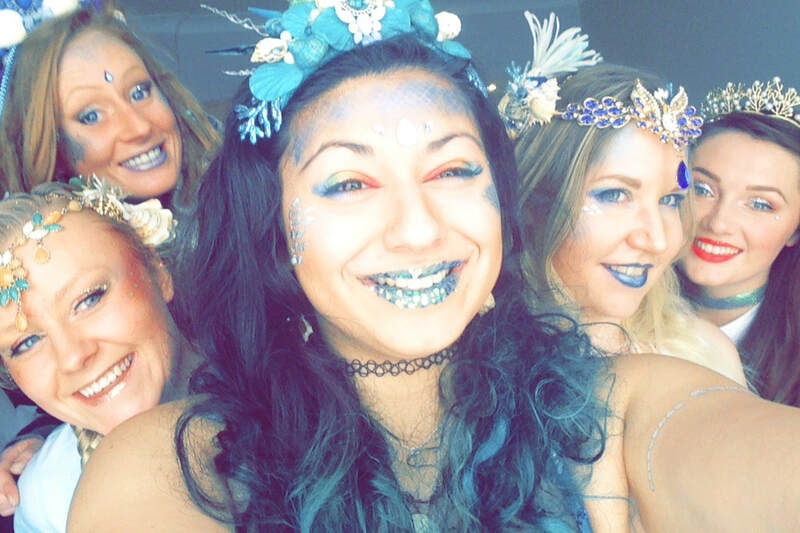 Splashing around, swimming in and out of tails, weaving between Merfolk​, my Mersisters and I had the most fintastic time! We spent the full three hours in the water, sacrificing lunch to spend more time in the pool! After emerging from the water (following lots of videos, photos and games), we were shown back to the hall where talks were given by Merthology Creations, Hire a Mermaid UK and Planet Mermaid. We snaffled some food and enjoyed the talks, then crossed our fingers as the winners of the Raffle were chosen! A few of my mersisters won some prizes, the lucky guppies! ​After meeting so many wonderful mers, we decided to all go out together for a lovely evening meal at a local restaurant. With good food, live music and perfect company, it truly was the best weekend a girl could ask for. I look forward to the next great adventure my mersisters and I get up to! So this is my first ever blog post and I thought I’d just introduce myself properly for those of you who haven’t met me yet or heard my story! On land, I go by Yasmin, and I am a first year medical student. Having just completed my Masters degree I have taken the leap into the field of medicine, with wishes to become one of the many great doctors that touch people’s lives on a daily basis. As a UK student, eligibility for funding towards a second undergraduate degree is tricky, and in my case, unobtainable. It has been my dream to pursue a career in healthcare since I left school and bouncing from being a waitress to barmaid on minimum wage in various places just wasn’t going to get me through medical school. So one evening late at the library when I was studying for my MRes exams (and by studying- I mean procrastinating and doing anything but..) I got particularly deep into the internet and found the most amazing thing.. Mermaid Camp.. IN THE UK! ​​The thing is, I have always loved Mermaids, mythology and legends, and I was well aware of the fact you could attend Mermaid camps in the US. However, as a student, travelling all the way to the States to become a Mermaid just was not feasible. So when I came across a Mercamp in the UK, I nearly fell off my chair. It took me all of about 3 minutes to have emailed the provider, sent her 4 texts and booked my place on the camp which was over 8 months away. I honestly didn’t care that it was so long away, I just knew I had to do it. Fast forward to now, having completed the camp, trained as a freediver and been insured appropriately, I am now living my life as a real life Mermaid and I have not looked back. Not only does this wonderful job allow me to educate children on the importance of keeping the oceans and seas clean, and making them aware of conservation efforts while keeping it fun, it allows me to pay my way through medical school in pursuit of my dreams of becoming a doctor. That’s just a little snippet of my journey into who I am and the start of my journey! I will be writing more and hopefully doing some short video blogs too, so keep your eyes peeled! If you have any questions or you’d like to ask me to talk about a certain topic or you have any suggestions for me, just throw them my way and I’d be so happy to get back to you!